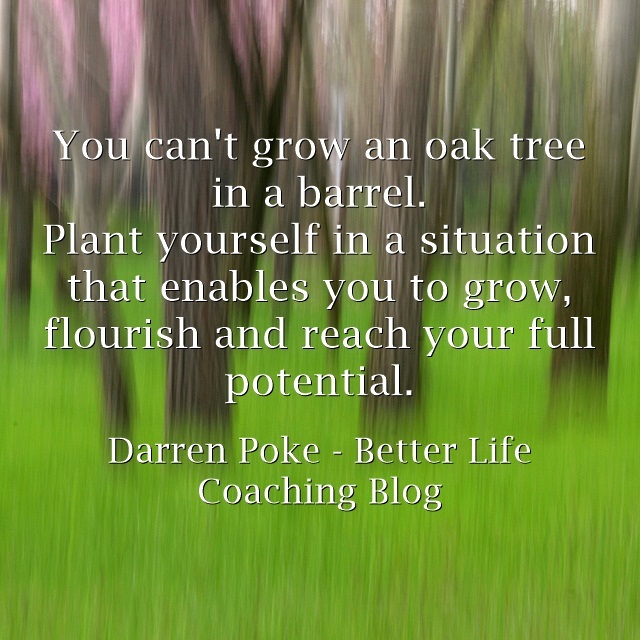 You can’t grow an oak tree in a barrel. Sure, the seed may germinate and start growing roots and a trunk. But it will forever be stunted. It will never reach its full potential. It will never provide shade for children or nesting places for birds. It will never have the majestic stature of a true oak tree. An oak tree needs good deep soil in the great outdoors to become what it is meant to become. And we aren’t that different. We too can stunt our own growth by limiting our perspectives, working in meaningless jobs for too long, spending our time with people who diminish us or not continually learning. Don’t be an oak tree in a barrel. Don’t stunt your own growth. Don’t stay for too long in a situation that is debilitating. Plant yourself in a situation that enables you to grow, flourish and reach your full potential. Next post – Who Are You Trying To Be Better Than?